CULLMAN COUNTY – Fairview's 21-17 victory over Springville Friday night had a playoff atmosphere even though neither team is bound for the 2016 Alabama High School Athletic Association (AHSAA) postseason. The air was electric because the Aggies were playing at Dafford Smith Stadium for the first time in three years. The game was very much even between the two teams, setting the tone for the final night of regional play for Cullman County teams. Cullman and Holly Pond qualified for the playoffs with wins during the 10th week of the regular season. West Point was looking to tune up for the playoffs while Cold Springs needed a victory to be playing at home when the postseason gets going the first weekend in November. It didn't go the way Cold Springs needed. The Eagles were shut out by Cleveland 28-0 and went from first in 2A, Region 7 to third following consecutive losses, the first to Tanner, the regional champion and then to a Cleveland team that was coming off a devastating 21-20 overtime defeat to Tarrant. The Eagles have made the playoffs three consecutive seasons and will go to Region 8 runner-up Sheffield on Nov. 4. Cullman had to win at Brewer, which the Bearcats did by the score of 34-14 Friday night. The Bearcats needed an Albertville loss to Southside-Gadsden to get the No. 2 seed in 6A, Region 7 behind Oxford. Southside couldn't contain Albertville, with the Aggies winning 42-28. Albertville had the tiebreaker on Cullman for a 44-14 win on Sept. 2. But Cullman is on a season-high five-game winning streak and finished 4-2 in its first year not playing in the region that contains Hartselle, Austin, Decatur, Muscle Shoals, Florence, Athens. The Bearcats will be facing Decatur in round one at Ogle Stadium. The question remains whether the Cullman-Decatur game will be on a Friday or if they play on Nov. 3. Austin shares Ogle Stadium with Decatur and the Black Bears are champions of Region 8. A decision will be announced by the AHSAA and the participating schools next week. Win and punch a ticket to the postseason is what Holly Pond had to do playing Vinemont from 3A, Region 6. A strong start by the Broncos became a game of survival as Holly Pond fought off Vinemont 27-22. The Broncos have continued their incredible turnaround from a 1-9 mark in 2015 to 6-3, the best record they have experienced since 2007. Mike Bates' hard work has paid off with Holly Pond in the postseason for the first time since 2011. The Broncos will be heading to No. 1 ranked Piedmont, the champion of Region 5, on Nov. 4. West Point was in the postseason prior to playing Curry Friday. The Warriors had the No. 3 slot secured on owning the tiebreaker over Corner. On senior night, West Point dropped Curry 47-12 and is in the 5A playoffs for the third consecutive year under Don Farley. The Warriors will be going into the Birmingham area for round one, taking on the Wenonah Dragons, the runner-up from Region 5. The last weekend of October will end the regular season with rivalry games and new matchups for local teams. Cold Springs plays on Thursday with a trip to Danville. The Eagles are eager to snap a two-game skid and get their fourth straight winning season, something that has never happened for this school in southwest Cullman County. County rivals highlight the final Friday of the month with Fairview visiting Holly Pond and Hanceville going to Good Hope. The Aggies want to slow down the Broncos' momentum as Holly Pond has won three straight at Thomas-Michelfelder Field and are looking for a seven-win regular season. Hanceville was idle for Week 10 and will invade Good Hope, determined to break the pattern after five consecutive losses and a 2-7 record for first-year coach Craig Flanigan. The Raiders are trying to avoid a winless season for the first time since 1994. The road team has come out on top in three of the last four meetings. Good Hope won at Hanceville 41-21 last season with the Bulldogs beating the Raiders the year before 22-21 when they blocked a field goal as time expired. Cullman will welcome Chelsea to Oliver Woodard Stadium with the Bearcats and Hornets using this as a playoff tune-up game. Chelsea is 7-2, second in 6A, Region 3 while Cullman has a 6-3 record. The Hornets come to Cullman for the first time. They have met twice in the playoffs with Cullman winning both times in Chelsea, 41-25 in 2007 and 14-7 in 2010. West Point goes to Moulton to match up with Lawrence County. The Warriors will be seeking revenge on the Red Devils; they had a 13-point lead in the fourth quarter last year and lost in the final minute 28-27. Both were playing in 5A, Region 8, but that changed after reclassification, with the two schools agreeing to keep the game on schedule for non-regional play. Vinemont resumes its rivalry with Falkville, who is 8 miles down the road inside Morgan County. The Blue Devils come to Mark Smothers Stadium, with this a pride game. Vinemont and Falkville are 2-7. The Devils lost to the Eagles 35-6 in 2009, the last time both got together on the gridiron. 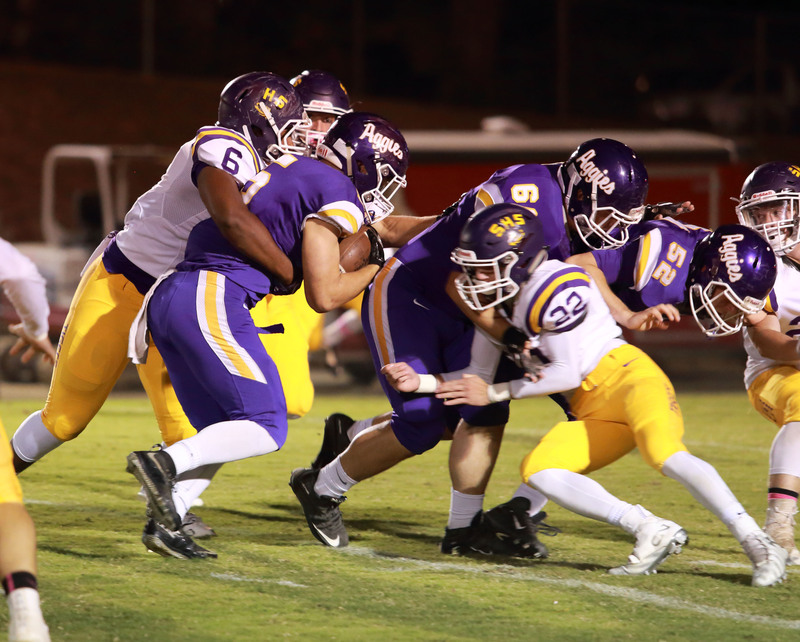 Addison seeks a "Perfect 10" when the Bulldogs meet rival Winston County in Double Springs. The No. 4 team in 1A was idle and is on the verge of becoming the fourth team since 1996 to go through a regular season of 10-0. Winston County is 1-8 and has been hit hard in seven consecutive losses, allowing the opposition at least 35 points a game. WC was beaten on Oct. 7 by Cold Springs 57-20, fell to Falkville 47-14 Oct. 14 and on Friday, got outscored by West End 73-28. The Bulldogs will host Shoals Christian in the opening round of the 1A playoffs Nov. 4. All games will kick off at 7 p.m. for the final week of regular season play in the AHSAA. Previous articleAre you up for the Haunted Maze in Eva?